VideoLAN, makers of the popular VLC Media Player program for various desktop and mobile operating systems have released VLC 2.2 for UWP today. 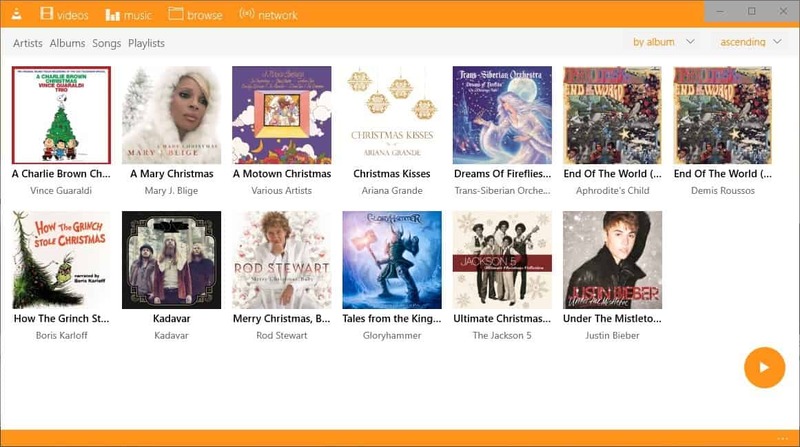 VLC 2.2 for UWP, what is that you may ask. When Microsoft released Windows 8, VLC ran a Kickstarter campaign to fund the development of a VLC app for that operating system. The campaign was successful, and the company released VLC for Windows 8 eventually to the public. Back then, I asked, "Who is going to use the VLC Media Player app for Windows 8", and I'm asking the question today again. The answer is different this time depending on the devices that you are using. VLC for Windows 10 is a great application, don't get me wrong. It is probably one of the best, if not the best, media player that is available on the Windows 10 Store. You can use it to play video or audio files, and also stream media. The player uses a different layout than the desktop version as it is optimized for touch. My answer back then was that no one but Windows RT users needed the VLC app. Any user who ran Windows 8 on a PC could use the desktop client which is more powerful in all aspects. You can modify the interface, install extensions, customize the player, modify keyboard shortcuts and other functionality, and do many things that the app does not support. That does not make the application bad necessarily, but if you have the choice between a great product and one that is good but inferior, you will probably pick the great one all the time. The situation was different for Windows RT devices as you could not run legacy Windows programs on the devices. The VLC app was a welcome addition on any device that desktop programs would not run on, but that was the scope of its usefulness. With Windows 10, things have changed a bit. First, there is still no reason to run the VLC application on a Windows 10 PC. The VLC program is still more powerful and better in all regards. But Windows 10 runs on other devices as well. It runs on Microsoft's Xbox One, and on Windows 10 Mobile. While the latter is more or less dead at this point, the Xbox One is not. Windows 10 may run on other devices as well where you may not be able to install desktop programs on. This changes the situation significantly. As I said earlier, the VLC app is not a bad program, but it is not great when you compare it to the desktop program. If you cannot install the desktop version of VLC on your device, then the VLC app is one of the best options that you have when it comes to installing a powerful media player. It shines when you compare it to other media players. I have to admit that I have not tried a whole lot of media player apps for Windows 10 because I only use desktop PCs and use better media players on these devices. There are dozens of these weird simple versions of already existing desktop software (not necessarily VLC, in your example). I think web-site applications make more sense, if not necessarily ideal, in the UWP ground. For example I like using Audiocloud (soundcloud) and Readit (reddit). I have two monitors and I can just snap it to one of them. Sure I can just open the website but these apps are far more easy to navigate and I admit it looks better, especially for Reddit. I’m not a fan of VLC. Martin has reviewed some great alternatives on the site before. But I don’t think there’s “no reason” to use this. If you’re on a tablet then using a simple media player is usually fine. Although if you’re on a tablet running Windows, the question has to be asked: what are you doing? The downside of website apps for individuals is privacy. The downside long term for everyone is that, should this way of doing things become dominant, it would make the web proprietary. Sometimes simple users need simple interfaces. There’s no need to use VLC, period. There are better players out there, like PotPlayer and SMPlayer. I find that VLC can play everything and anything I need it to and does a great job doing it, I see no reason to replace it to something else. The developers of VLC made a statement to say that anyone who disagrees with their political stance isn’t welcome to use the program, so that’s one reason since supporting totalitarians is usually bad. The developer of Notepad++ did the same thing. I forget what their actual views were, but I’m not getting behind anyone who thinks that “anyone different to me is bad”. I use better programs: SMPlayer and Programmer Note 2, both of which are best-in-class. >What’s your take on this? I want to reduce the amount of Win32 apps I use to only those that are strictly necessary. UWP is increasingly becoming powerful enough to cover and thus replace Win32 in a lot of use cases. Never tried it, for the obvious reason: I use Windows 7. But if the approach is the same as with mobile players, which is to scan the entire drive for media files, that could be a pita on a desktop, with like three HDDs and terabytes worth of data in hundreds of thousands of files. I never liked this approach even on mobile phones, I prefer to open files with VLC from a file explorer. And the interface is just a no-go for me, looks too simplistic, and all the customisability is gone, just like every other “modern app”. There’s no need to use UWP apps on desktop, period. Native applications have better performance and are more complete, UWP applications are too basic and more prone to break. Unless you are using Win10 in Tablet mode on a tablet device. 2. Definitely no reason to use VLC Stupid (UWP) Edition! Anyone using a 2-in-1 in tablet mode, Xbox One users, and the millions to people still using W10M can use the UWP VLC app. However I have found that the new version of the app crashes on startup on both my Desktop and W10M phone. So, look for a fix release soon. I have heard that reinstalls work for some people, but not others. Didn’t work for me. One reason to use UWP version is that it actually sees upnp servers. The desktop version has problems if Virtual network adapters are present. Desktop version of VLC is the only media player worth installing. There IS a reason for VLC UWP, it’s because of touch interfaces. If you set my wife down with a Windows 10 tablet and ask her to use the VLC Desktop app to watch videos, she will toss the tablet across the room. Asking a touch screen user to manipulate an app that was designed with the precious of a mouse in mind is NOT ideal. Touch need larger buttons and things like slides, taps, tap and holds to get to a few options, not a “right click” menu pop-up that is hard to select. if you find them eventually, and you will, just get a program like File converter (open source: http://file-converter.org). it’s 40MB well wasted in my opinion, instead of those 500MB or whatever from VLC. Be advised that there’s a bug with the VLC UWP where if you’re using a touchpad, it will break tap to click and turn it into a locked click – basically, it’ll start dragging things around instead of just clicking on it. The only fix is to reboot. This kept happening after I upgraded to Windows 8 and couldn’t for the life of me figure out why until recently. Well I’m new to windows ‘apps’ but I’ve just got hold of a surface and my experience with the app compared to the desktop version is trully awful. Only reason I’m using it is because I want the surface to be asleep whilst playing. i cannot describe the levels of frustration, confusion, incomprehension and fury it has led me to. Of course the desktop VLC stops playing as soon as the surface goes dark. Seriously can’t believe it can be so difficult to do something that I can do on my phone without a second thought. Low IQ post. Of course there are reasons. Major one being that it (like any other native app) won’t break your system and leave a huge mess after installation/uninstallation. It’s what makes UWP apps superior to 32-bit ones. It will still play pretty much everything you need to, but the nature of UWP is restrictive enough to not let it do what it’s not supposed to. It’s why I’ve opted out for portable apps in the past (which can still mess up the registry), but this is so much more elegant. I wish every app had a uwp equivalent so that I could ditch them all completely.